Many congratulations to Debbie and Peter who were married at The Lawn, Rochford on Saturday 17th June. It was a great pleasure to create such a beautiful wedding cake for the happy couple, there’s nothing I love more than making sugar flowers, although very time consuming I find it extremely therapeutic! 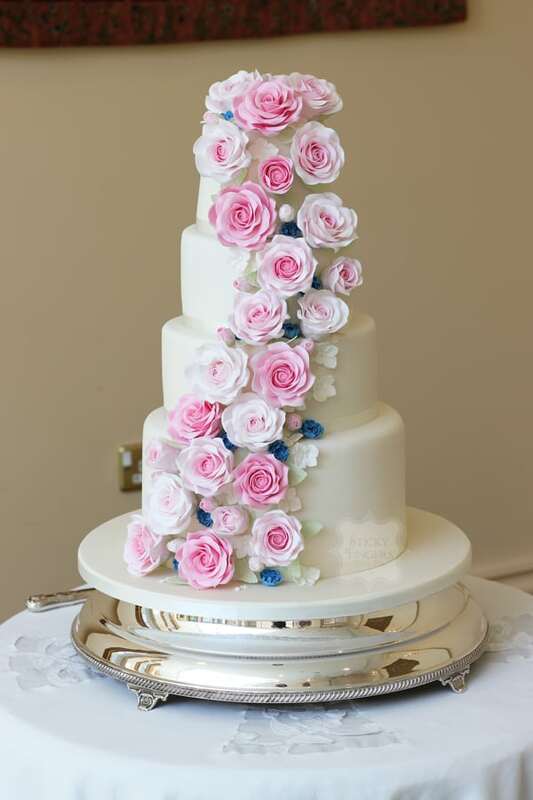 Debbie was carrying a bouquet of mixed pink roses which were replicated in sugar form for the cake along with a few lovely blue cornflower and hydrangea blossoms. The flavours were traditional fruitcake for their top tier, then rich, dark chocolate, followed by lovely lemony lemon cake. Their bottom tier was a dummy, which gave the cake a lift for a more dramatic look. We hope you had the best day ever!